Copenhagen is a dream. 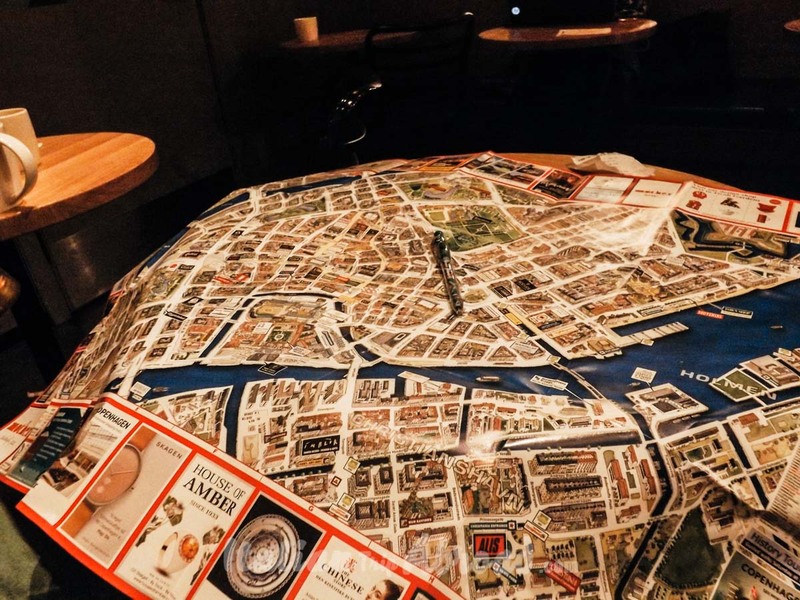 It is a cute, curated and enjoyable city. You can visit the city everytime in the year, but for sure the best time to visit Copenhagen is in Winter. This is not just a guide on the best things to do in Copenhagen in Winter, it will be a fairytale of a dream. 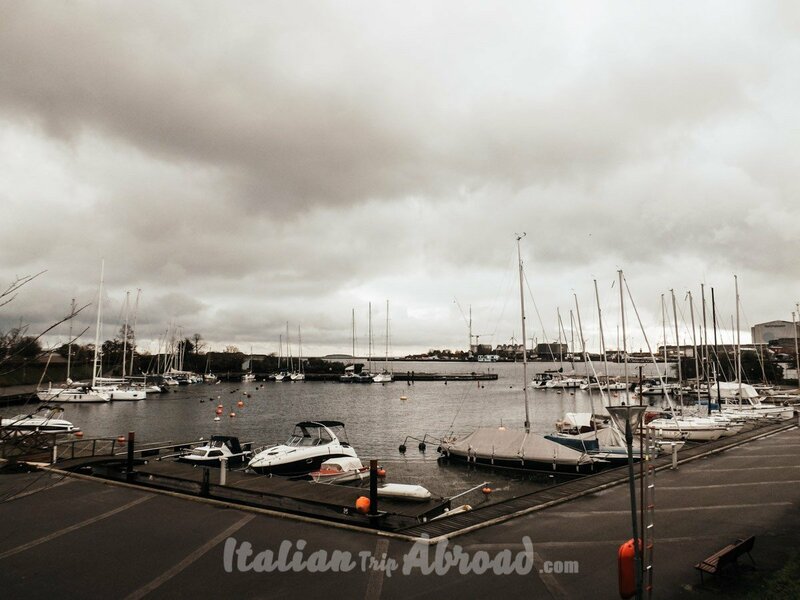 When we stepped off the plane from London to Copenhagen, it was a cold day in November. The city looks just pretty and quiet that make us feel so warm inside. 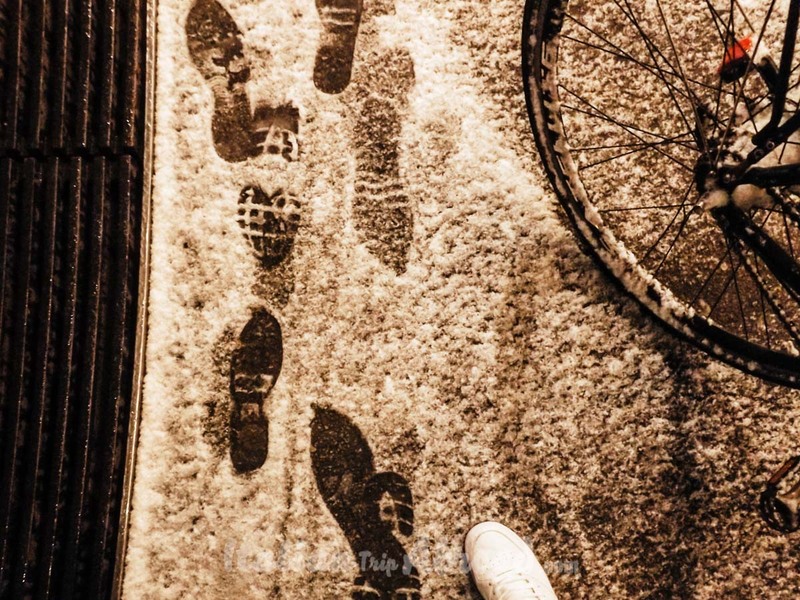 The winter go slowly, due the lowest temperature, is better to plan to do activity inside the hot buildings. 48 hours in Copenhagen will be the best way to enjoy all the landmarks of the city. 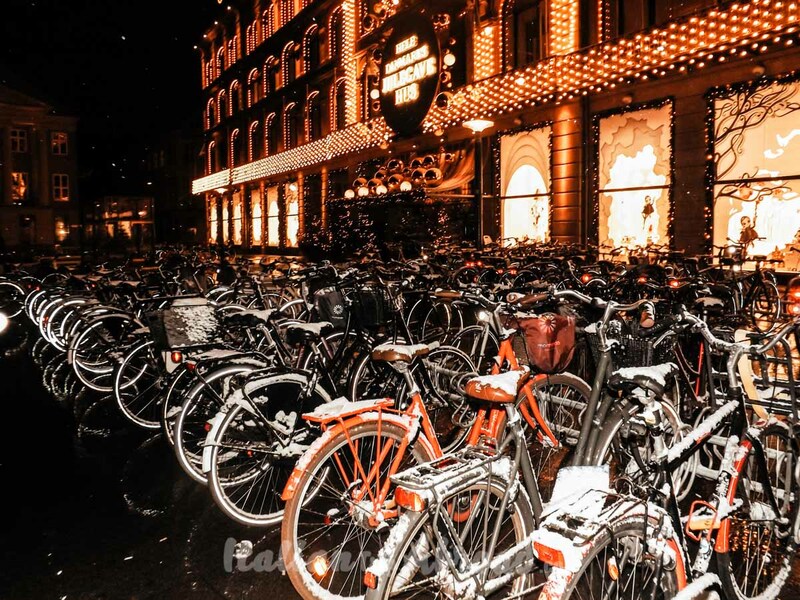 The vision of Copenhagen at the first impression was exactly the European Christmas dream. We were looking forward to finding a nice city, tiny but with a grey sky, thinks we don’t like at all. Tivoli Gardens and the Town Hall are just next to each other, and both need to be visited. We will suggest you stay around this area, and take as a landmark the Shopping Centre Magasin du Nord. The Nyhavn a canal where you can shot the amazing colourful typical buildings. It was founded in 1843, and still well preserved some of the attraction of that epoque. The Roller Coaster of the Tivoli Garden is the only version in the world to have a brakeman on board of every cab. This location is a must do in your list of things to do in Copenhagen in winter. The journey will take you a bit longer, but if you are planning a week in Denmark, this landmark is highly suggested. Escape from your 9 to 5 job and hug a lovely relaxing weekend in a European Country where the quality of life is on the top in the World. Plan in advance your Copenhagen itinerary, due to the city could be small, but you can miss a lot of important sightseeing and events. It was just a few days after Alessia’s birthday and was the first travel present since we have been together. Absolutely we didn’t know what to expect. We had no view at all, just 48 hours in Copenhagen to explore the capital of Denmark. We prospected Winging. The period was the classical Christmas time, lights everywhere, shops decorated and magic air. The Christmas Markets were already filled with products typical of the period and the region. Also, we were assuming it would be freezing, but the magical scenario was giving us warm in the heart. First of all, you will fall in love with the canals of Nyhavn. The colourful tall and thin buildings, the narrow borough and the boats on the side of the canal. It is the perfect scenario for your next postcard from Copenhagen. Copenhagen is one of the most popular Scandinavian City, it is the Capital of Denmark. If you are planning a day trip to Copenhagen is well to know, you will find a lot of bargain from London or the major European city. In winter you will find regular deals on the flights to Copenhagen. We had our flight for less than 20$ return from London, it was a classic winter escape in Copenhagen. This is will be our personal guide on the best things to do in Copenhagen in Winter. We will kindly suggest you to start to discover Copenhagen without your luggage, the city path is not really comfortable with a travel bag. If you don’t have the chance to check in your accommodation as soon you arrive, you can pay for a small locker in a railway station. There are a lot of Railways stations around the city with the chance to leave your luggage in one of the lockers. In the main Train Station, where you will arrive on the train from the airport, the Central Station, the price for a locker can go from 65 Denmark Krone to 110K. Copenhagen is a lively city in northern Europe, one of the most interesting cities in the Scandinavian Area. There are a lot of things to do in Copenhagen. The Nyhavn is for sure the first things to put in your list, this is the most known place in the Capital, where you can snap your next insta-story or make your personal postcard. 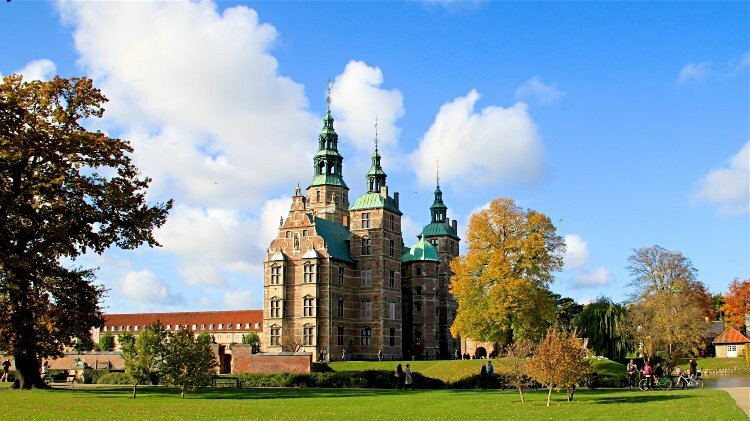 Rosenborg Castle is one of the most suggestive places in Copenhagen, visit it and the Amalienborg Palace, to compare the two Palace styles. For sure you will know the symbol of Copenhagen. No, we are not talking about Carlsberg, another National Monument. We are instead talking about the Little Mermaid, the statue on the entrance of the Copenhagen Harbour, the creation of the Danish Author Hans Christian Anderson. The Rounded Tower is another place to don’t miss in Copenhagen, it is in the city centre, and even if you are a shopping addicted, you need to pay a visit to this place and the Observatory centre on the top of it. 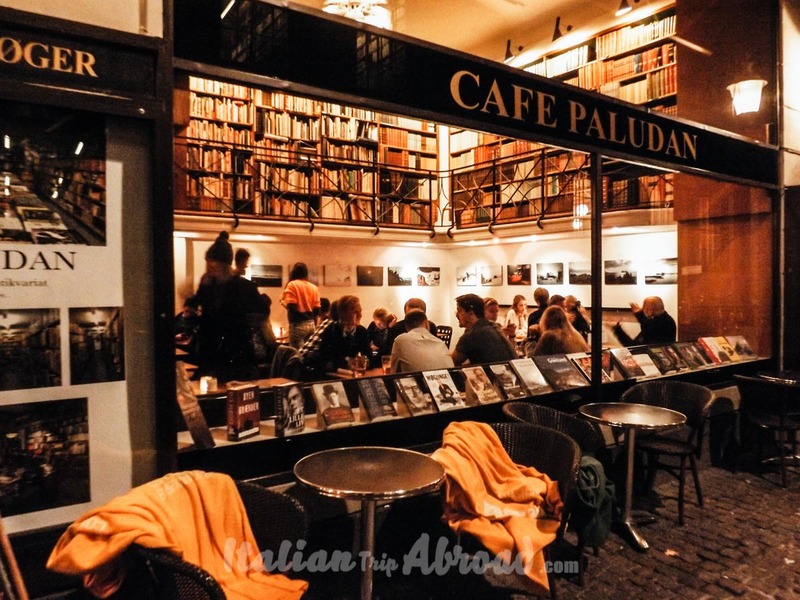 If you are looking for some cool things to do in Copenhagen during your stay, we will answer the most common question “What are some fun late night things to do in Copenhagen on a Sunday”. As we said, Copenhagen is a lively city, with a great nightlife and rich in pubs and clubs. Head to the Culture Box or the KB3 for your best night out. Those are two of the best music clubs in the Danish Capital, both open at late night and the entrance fee is not expensive or free at all. Check the event list for more information about. If you are heading to the Little Mermaid city for just a day, don’t be stressed, focus yourself in the city centre attractions. Visit all the castles there are in the area of Nyhavn. It is one of the best Shopping Centre in the city, full of food places and shops. If you are staying in Copenhagen for just a day, don’t waste your time in the shops, there is a lot to see around. Beard in your mind it is impossible to visit the Tivoli Gardens in just one day, it needs a full day or at least half of it. We have been in Copenhagen for 48 hours on our last visit, and still thinking it wasn’t enough. 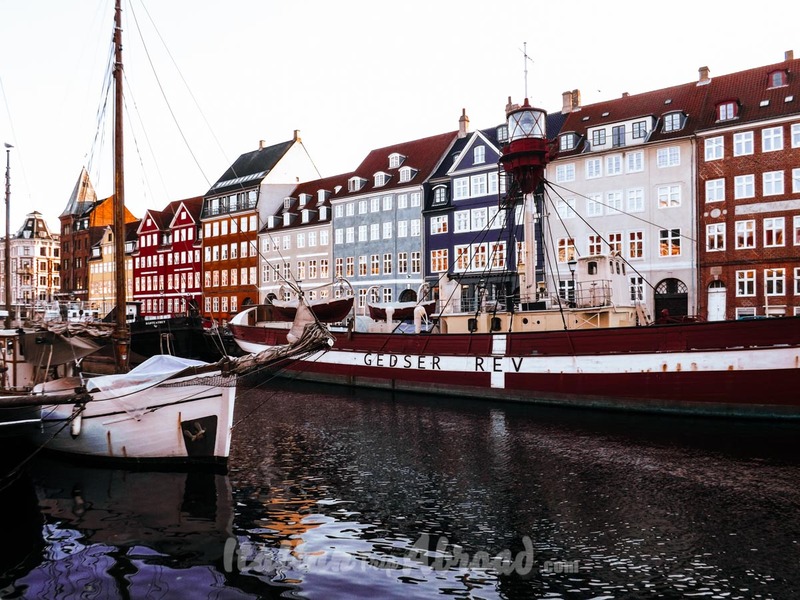 Places to go in Copenhagen – Best places to visit in Copenhagen The Nyhavn is one of the best photo spots in Copenhagen. 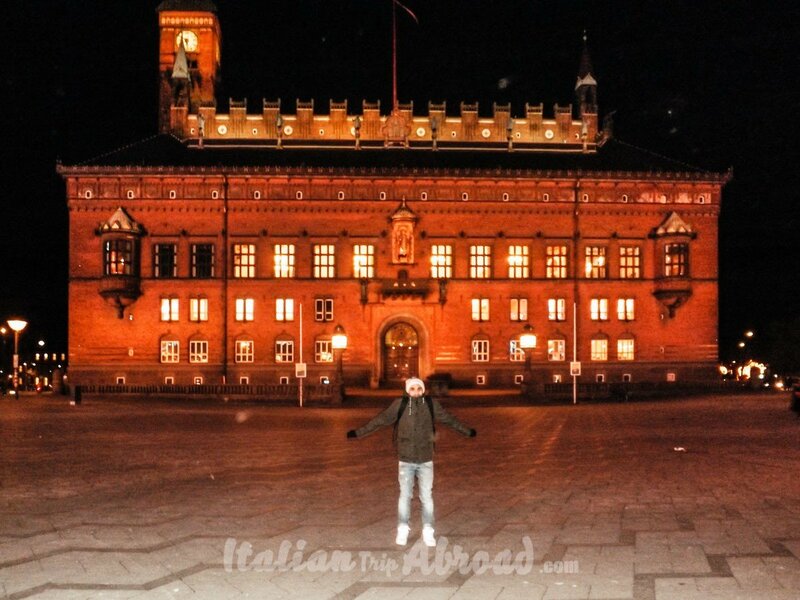 For us, it is absolutely one of the first things to do in Copenhagen. It is the main photographed scene of the Danish Capital. It is really suggestive in winter, and amazing and crowded in summer. If you are lucky, especially at the weekend, here are taking place a lot of amazing activity. It is one of the most instagrammable places in Copenhagen. There are some traditional boats, and it will take you inside the tradition of this city. From the Nyhavn, you can take your ride on board a Canal boat tour. It is expensive, so check better before land in Copenhagen. 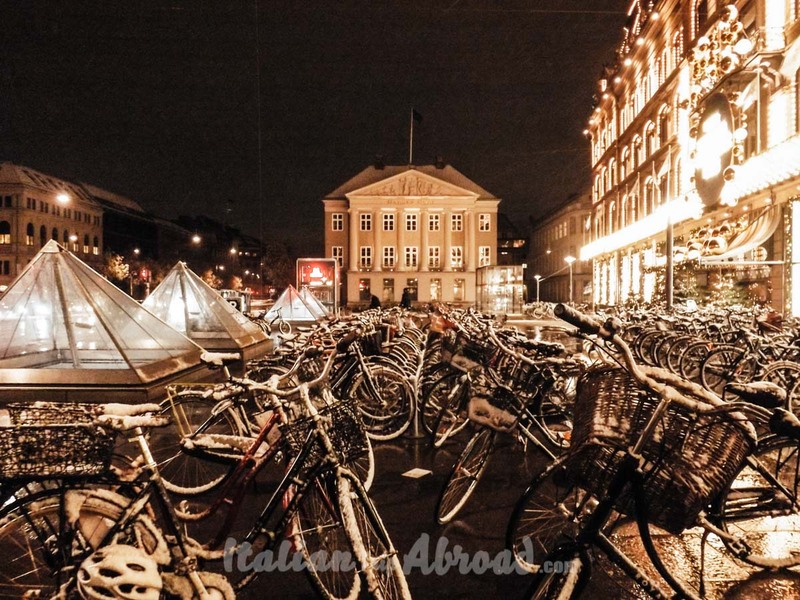 This is another top things to do in Copenhagen in winter. Rosenborg Palace is in the city centre, it is a Royal Castle and a museum. It is situated in the museum district and you will find it without any problem. 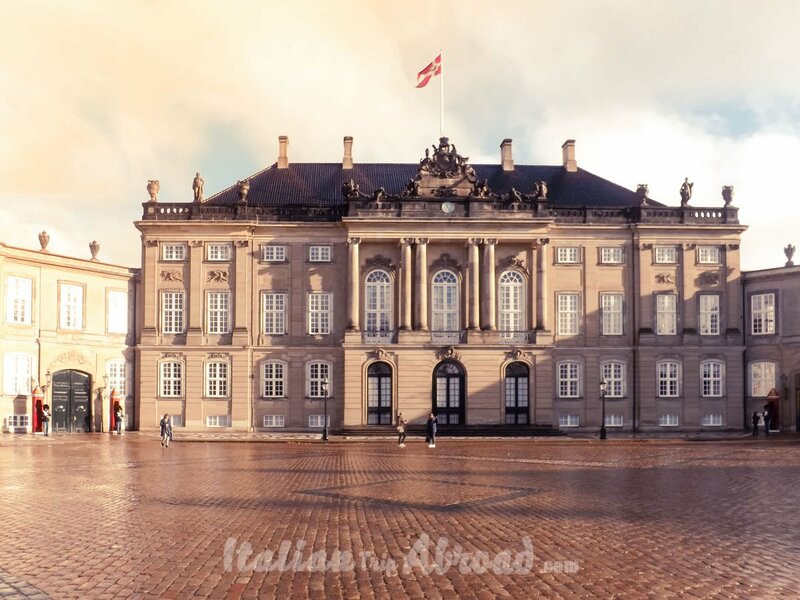 This Castle is still actually used by the Danish Royal Family, this is famous not just because is a beautiful city castle, one of the best in Europe, but also because of the treasury highly surveilled in the basement.This castle is the home of some of the most precious jewels of the Danish Royal Family. This is absolutely the symbol of Copenhagen. In the past, it was the very welcome to the city for the sailors of the North Sea. We have been there in winter time, the weather was not the best, but the emotion to be in the presence of the little Mermaid made us happy to be in Copenhagen. The statue is really small, it is on the rock, to get close to the statue you have to be careful, the stones could be really slippery, especially in a raining day. 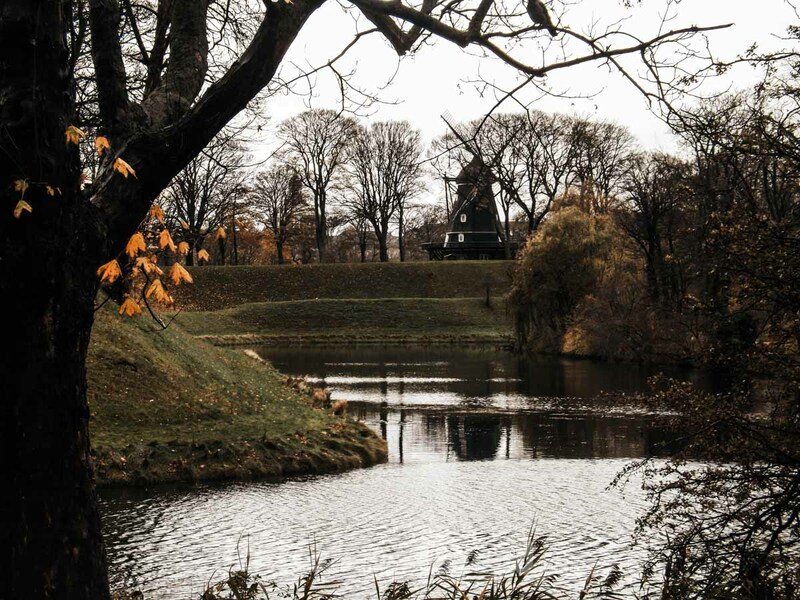 For us it becomes one of the most suggestive attractions of Copenhagen, together with the natural parks, it will become the location where you spend more time. Head here if you want to assist to the changing of the guard. It will take place at Amalienborg Palace every day at 12. As all the Changing of the Guard, it will depend on the presence or not of the sovereign. 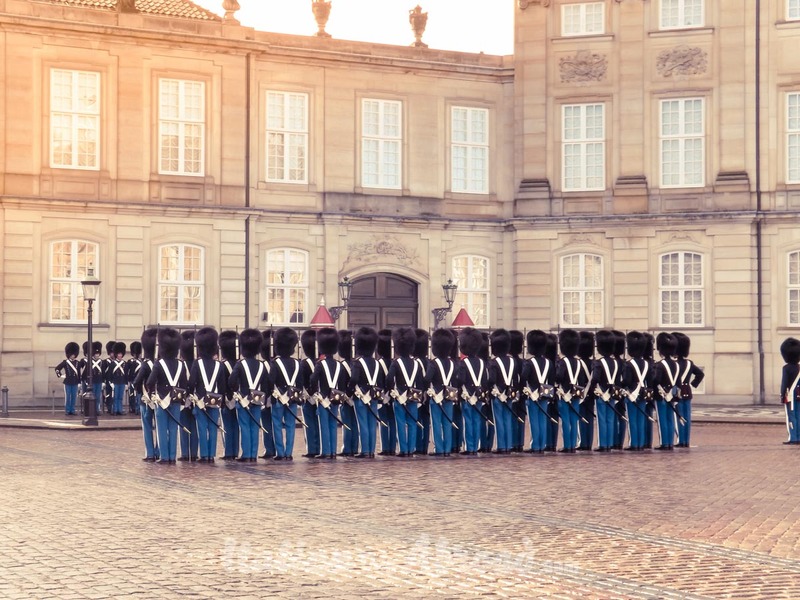 Even if the weather is not the best we will highly suggest attending the Change of the Guard at the Amalienborg Palace, take your place on the side of the square and wait for the first band sound. We arrived early and attended a bit when it starts to happen, the square becomes close on all the way around and the police were organising the people around the square. The ceremony is a bit different than the one at Buckingham Palace in London. 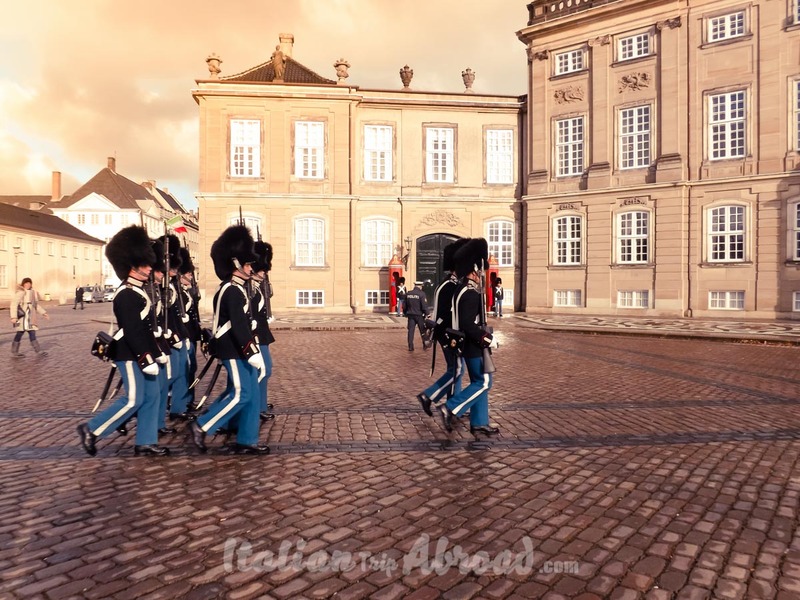 The band and the guards are marching from Rosenborg Palace to Amalienborg Palace through the little streets of the city centre, you can listen to them from all around and join at the back or on the side of the streets towards the castle. 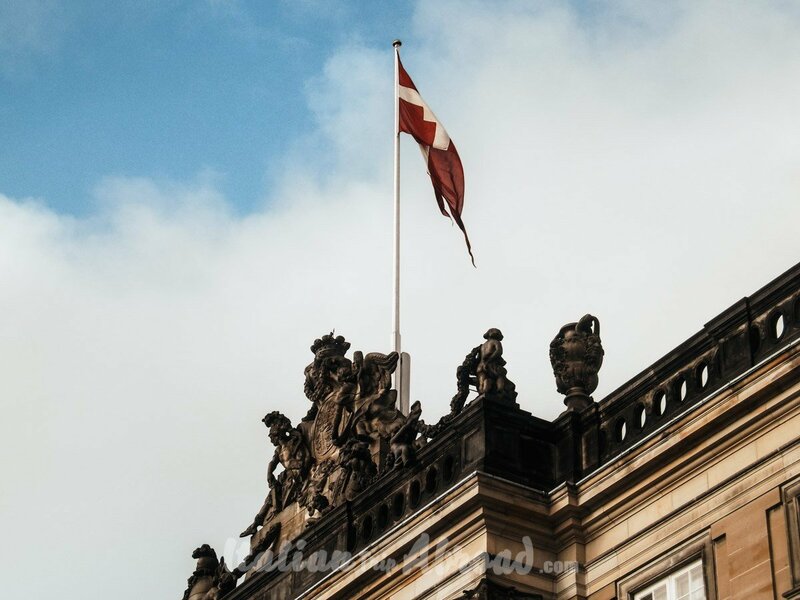 Check on the website of the Palace if is open on the dates you are heading to Copenhagen, if the Royal family is not in the Palace, it will be open to the public visits. The name of this place can sound nothing for you, but it is one of the best building in all the Scandinavia. It has the highest and big dome in all the region. For a lot of people, it seems inspired to the St. Peter’s Cupola in the Vatican City in Rome. The funny fact behind this church is that, because of problems between the Architect who made the project and the Sculptor, who had to make the statues for the interior. Those were too big for being stored in the hallow, so those were placed on the external facade. 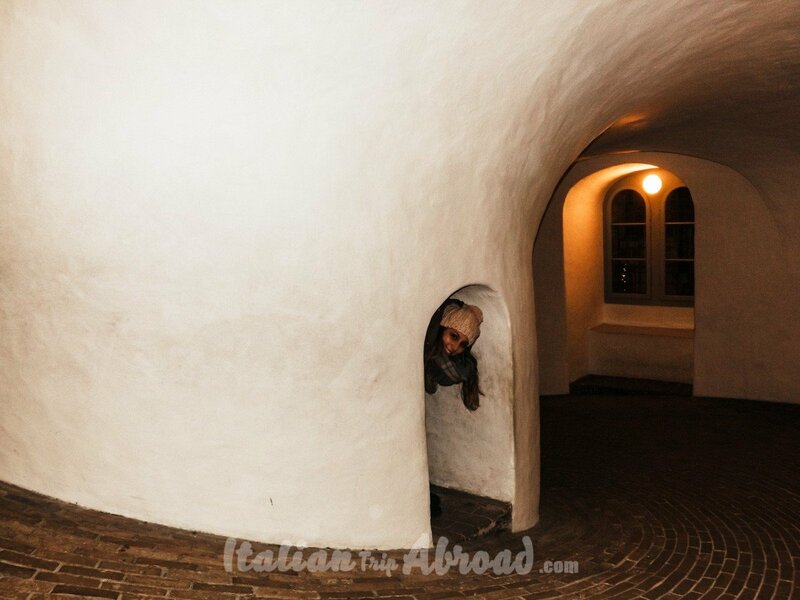 On The Round Tower, we have one of the best memories of Copenhagen. We were hiking up the Round Tower in the afternoon, while it was already winter, was dark and the light of the city from the top was amazing. Already enthusiast about the view from the top, it started to snow and it was absolutely magic. The perfect way to end the first day in Copenhagen. Soon everything was white and enchanted. The Round Tower has no stairs to go to the top, it is a 17th-century tower really unique in the World. The Round Tower is not just a nice building where enjoy the view, but also it is also the oldest functioning observatory in Europe. Going to the top of the Rundetårn, the Round Tower, you can stop in one of the exhibition or on the side of the Observatory. 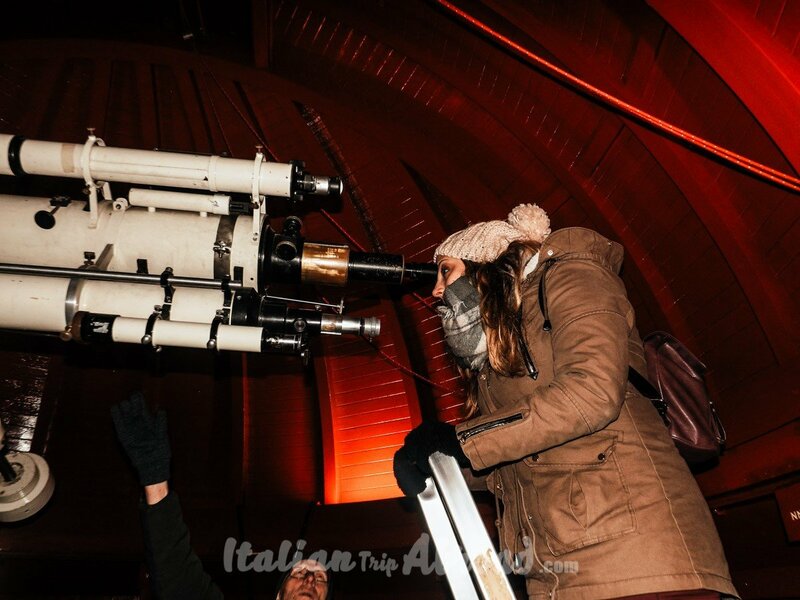 On a clear day, you will be able to see from the telescope. Remember the tower in winter will close around 4 pm, just on Tuesday and Wednesday it is open till late and allow the access to the Runderaarn Observatory. The price for a visit the Tower is of 25DKK, less for children, free with the Copenhagen Attractions Card. Welcome to the magic world of Copenhagen. Tivoli Gardens is an amusement park in Copenhagen. It is a must see in the Denmark Capital, suitable for kids, young and even old people. It is located in the city centre, just at the end of the main shopping road. Within a few minutes from the Tivoli Gardens, you will reach the City Hall and the Copenhagen Central Station. Tivoli Garden has been the first direct inspiration for Walt Disney to build up his own version of Disney World. Hans Christian Andersen, the fairy tale writer, who died in Copenhagen also visited the park many times. Those are just a few important things you have for don’t miss the Tivoli Garden in your Copenhagen Itinerary. If during the daylight of the day, the Tivoli Gardens looks amazing, it is at night when the magic happens. At night, the lights go down and shadows start the dance, thousands of coloured lights create an amazing atmosphere, making you feel to be in a fairy tale of a nordic Author. Take a ride on a roller coaster of 1914 and enjoy the time of an old epoque. If you are planning to visit Copenhagen at Christmas you cannot miss visiting the Tivoli Garden. The Atmosphere is amazing. The park is open until 11 pm, and some days until midnight, but check on the official website for the update timetable. The entrance ticket will cost 120 DKK, 18 $. For children under 8, the entrance will cost less than 50 DKK, 7$. While this location is overcrowded during summer, in winter time the City Hall is amazing too. It is a building from 1900, inspired by the Italian City Hall of Siena. It is really close to the Tivoli Garden and you can add to the list just after visit the Amusement Park. During summer time the City Hall open its door to visitors and you can visit inside, while if you are visiting Copenhagen in January is not permitted to enter. Close to the City Hall, there is the area of Stroget, a shopping area with tons of shops and the major international brands. It is a completely walkable area, it is listed as one of the best and famous Europe’s longest pedestrian streets. Visit Copenhagen in winter is not the only option to enjoy Denmark. The Scandinavian area has a lot. Even if Denmark is small, you have a lot of see and landmark to discover. From Copenhagen, you can reach every corner of Denmark and not only. Some suggestions are the Møns Klint. It is the main attraction of Møn island, the chalk cliff known as Møns. Take your boat cruise and enjoy this in winter, with the snow. You can even reach other Scandinavian Country from Copenhagen. In about two hours you can reach Malmö in Sweden. Thanks to the suggestive Øresund Bridge, which link Denmark to Sweden, you can reach the Swedish Capital in an hour. 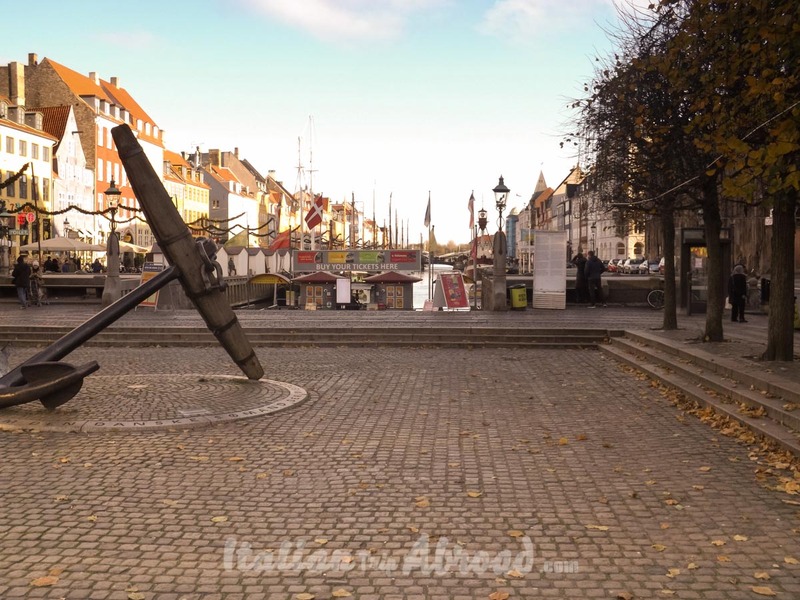 You can visit Malmö from Copenhagen even by boat, or train. Copenhagen is the best idea for a winter trip. If you are based in London like us, or in Europe in general, you will find pretty easy to have a flight linking with this amazing city. The flights to Copenhagen are really cheap, we had ours for less than 20$ return. If you think from here you can reach all the Scandinavian Area for cheap, it is a Bargain. Also, spend just a weekend in Copenhagen is the best way to escape from your routine. Danish ski centres are some of the best equipped in Europe. 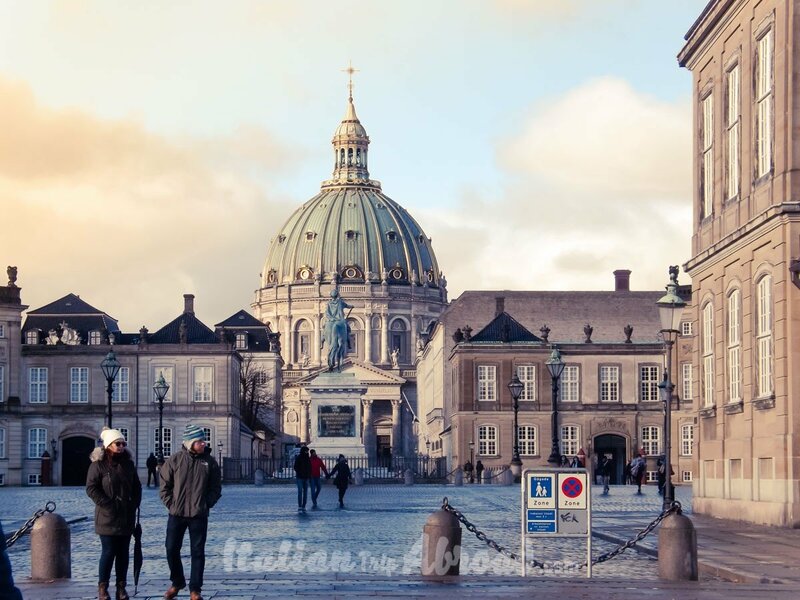 Those are just a few ideas on why Copenhagen winter break is the best idea for you. Denmark in winter absolutely looks cold, stupid answer not? But it is true. We were not fully enthusiastic about the idea to visit a cold place, because we come from South Italy, and the warm temperature is in our DNA. Anyway, we did it, visited Copenhagen in a cold winter and Denmark assumed another light with snow. Don’t be scared about the cold, all the places are really warm and heated up. Sometimes you will feel even too hot in some clubs and bars. One of the best things we love to underline is, in our Air Bnb, we had the heated floor, and basically, Toti slept in shorts. 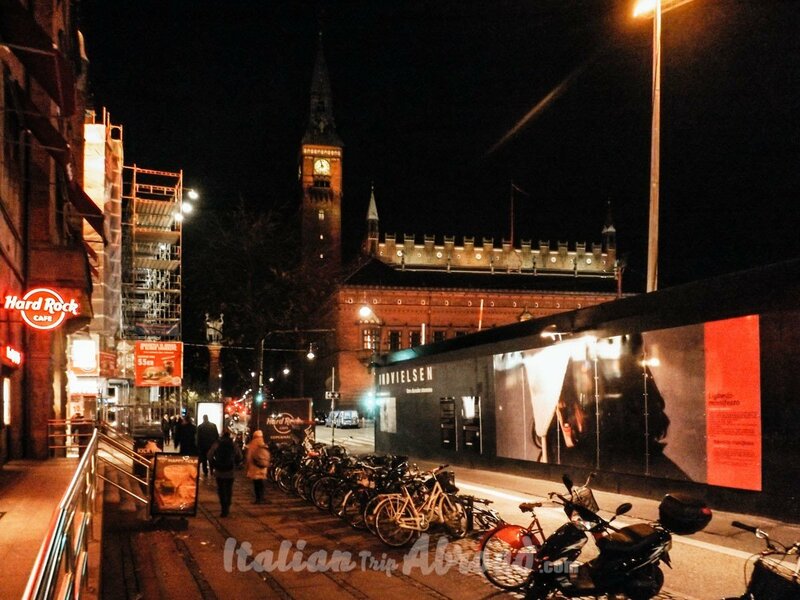 If you are planning your visit to Copenhagen in winter, try to organize your stay around the Christmas time. In the middle of November here start the Christmas atmosphere, with the first Christmas Markets taking place at the end of November, beginning of December. 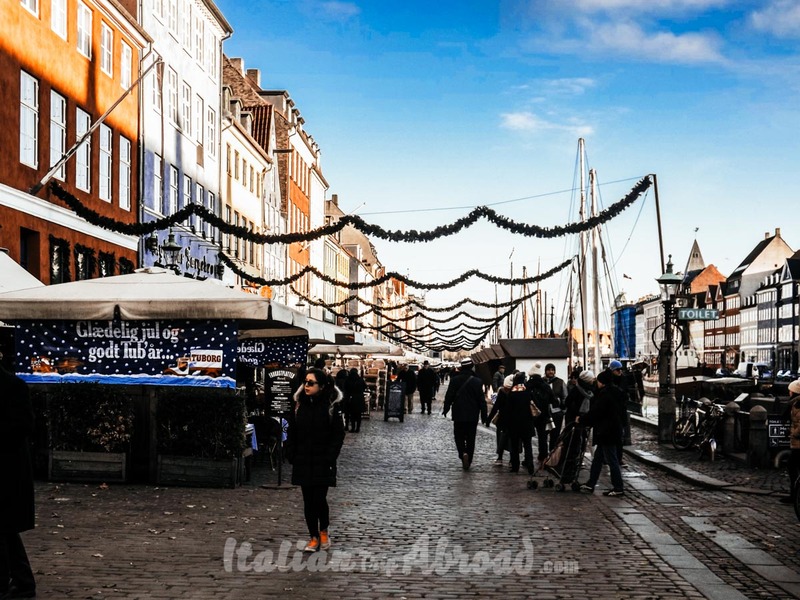 As you can see there are a lot of things to do in Copenhagen in winter, even if you are planning 2 days in Copenhagen or like us an escape of 48 hours trip from London. The prices in Copenhagen are pretty high, that what we continuing to say to who ask us how is Copenhagen?. It is a pricey city, and bear this in your mind when you are organizing your weekend in Copenhagen. Beautiful pictures. They really tell the story!! Wow what a beautiful city! I have never been! Gorgeous! I’ve been to Copenhagen and now I feel like I need to go back in the winter just to see it! Thanks for the inspiration! This all looks like it would be a lot of fun! I will look into these if I ever have a chance to visit. You’ve totally sold it to me from this post, I’m going to make it a goal to visit at least once this year. What a beautiful city. I would love to view the palace and castle. I love all the lights as well. It looks like a nice place to explore with lots of history. 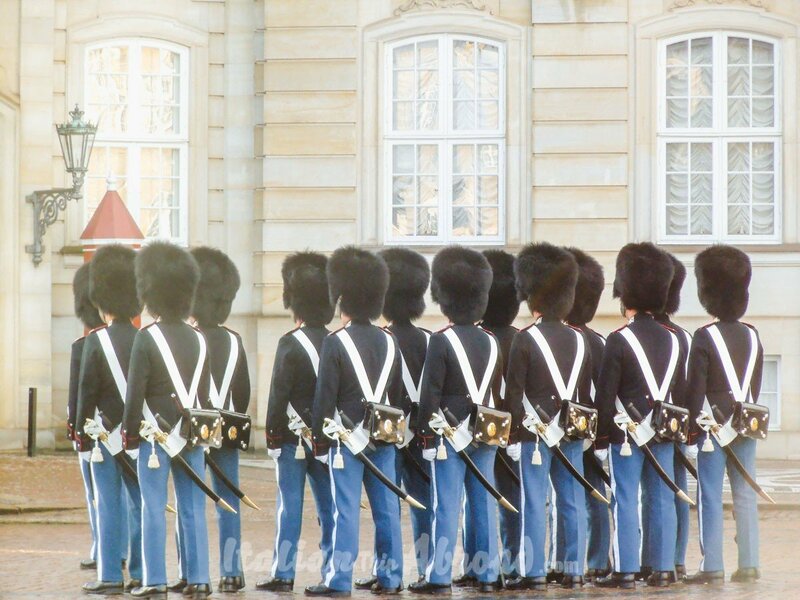 I have always been fascinated with the changing of the guards. I didn’t realize this was also a practice in Copenhagen. This feels nostalgic!!! I visited Copenhagen twice for only 24 hours! You’re lucky you had 48 hours!!! Glad you had a great time even it was a short layover. Great place!!! Wow! What a great city to explore a little bit of everything! History, art, and beautiful scenery is like the perfect travel trifecta! You are an incredible photographer as well. These photos are stunning!! Thank you very much. Copenhagen is a really lovely city, really cold during wintertime but magic at the same time. Wonderful old world and modern images of Copenhagen. Thank you for taking us on an extensive tour around the city! Dying to visit here! I’m loving all the photography shared on this post and great tips! Loved the way you narrated your experience. You also shared dress code tips, planning in advance etc which makes this post a perfect guide for Copenhagen tour. Happy to see that you had a great experience. I’ve never been to Copenhagen but really want to go. Your post made me excited to plan a trip there! After reading your Copenhagen story, i believe I should visit this as well. Im excited to experience the travel, the Copenhagen way. I have never been to Copenhagen, but posts like this really make me want to visit! I think that it is really important to have places to visit when traveling in the winter, and you provided great suggestions! Beautiful city! Even the pictures of simple snow on bikes makes this place look like a dream to visit. Thanks for sharing! Copenhagen is a beautiful city and, while I’ve been there a few times, I haven’t done everything. Must go back soon.